When I went to run the tests for my PC, I was prompted to install PC Matic. But I kept getting the error that I'm not running Internet Explorer version 5 or Higher. My System consists of Windows 7 Pro 32-bit and Internet Explorer version 11. Is this rig fully updated through Windows updates? That's the first place that I'd go to trouble-shoot such a message. The software requires a Windows PC. I bought the 1 year subscription and tried to download the install program. 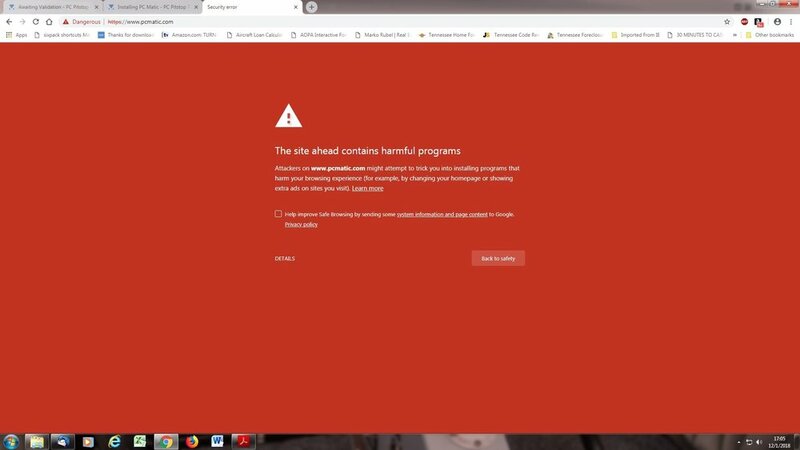 Chrome flags pcmatic.com as a dangerous site and wont let me download the program. I think you have been blacklisted for some reason. I opened a support ticket on Thursday on the site but no response. If i click details and go to the download page, Chrome says its a dangerous download and aborts the download. Thanks for your report and sorry about the trouble it's causing. We're working to rectify this, but it may be a day or two. In the mean time, please do as follows in Chrome as it will allow you to download the installer. The following steps will turn of phishing and malware warnings, as well as download warnings. Under "Privacy," uncheck the box "Protect you and your device from dangerous sites"